Good cheese fondue should be shared around the table and is utterly delicious. Rub the cut side of the garlic clove around the inside of your fondue pot. Discard the garlic. Add the wine and bring it to the boil on a medium heat on the stove. Turn the heat down and add the cheese in handfuls, stirring until it melts. Mix the cornflour with the Kirsch, and stir into the cheese. Cook for 2-3 minutes, stirring, until it is thick and creamy, then remove from the heat. Add pepper to taste. Fondue should have a smooth, thick-sauce texture. If it is too thin, add more cheese, or stir in a little more cornflour, blended with wine. If it's too thick, stir in warmed white wine. If the fondue separates, keep stirring and it should recover. If not, add a squeeze of lemon juice or a teaspoon of cornflour dissolved in wine. Move the pot to a burner on the table. Stirring often to keep the fondue smooth, spear the bread on fondue forks and dunk into the cheese. A fondue needs the right cheese. Those mentioned in this recipe are the most popular, but you can use Vacherin or Appenzeller instead of the Emmental. You could also use a French Comté or Beaufort, but don't use Cheddar - it won't give the authentic, stringy texture. You could try substituting half the cheese with a blue variety, or adding chopped shallots, green peppercorns or diced ham at the same time as the cheese. It's traditional to dip bread in fondue but you could try lightly blanched broccoli and cauliflower, or crisp celery or chicory. Try serving a green salad with your fondue. Other nibbles can include cornichons, silverskin pickled onions and cured meats. The Italian version of fondue is called fonduta. It is made withFontina cheese and egg yolks. 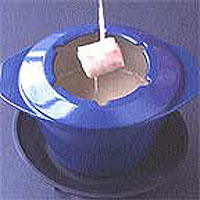 Fondue sets that include a pot, burner and forks are available from John Lewis.